Believe There is Good in the World. This has been a very difficult month for all of Iowa. But you already know that story and we are not going there. Then today, Saturday, August 25, 2018, I was out for my morning walk when I noticed this garden pole along the trail less that two blocks from our home. This made me think back when I was a kid growing up on the farm in Western Iowa. When there were needs, the neighbors would pitch in to harvest crops, provide food, clothing or sometimes just provide love and support to their friends and neighbors who were going through difficult times. Years have gone by--but nothing has really changed. It may play out in a different way, but those basic support systems are still there. When one of us succeeds--we all succeed and when one of us hurts--we all hurt. Those are just Iowa values. 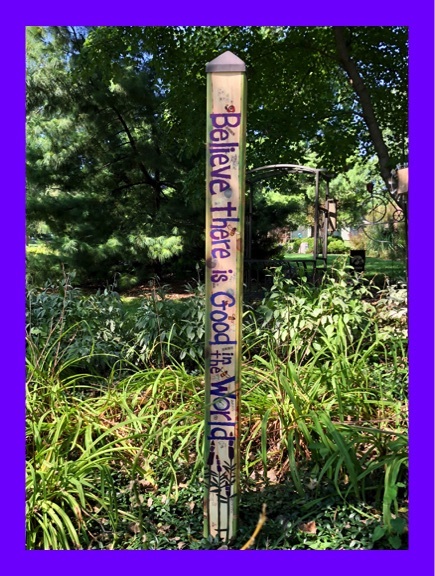 This simple garden pole says that so well: Believe There is Good in the World.